The over-the-top, 1930s styled Strange Brigade was launched by Rebellion Developments this past August and is not shying away from adding new content. This past week alone they have released the first DLC, Isle of the Dead, new maps, and a new character. The post-launch roadmap does not stop there, as continual content is planned to be released through the end of the year with more DLC and characters included for Season Pass holders. Strange Brigade is a one to four player third-person shooter that takes the adventurous team of separately skilled characters to mysterious ruins and pits players against terrifying enemies and environmental puzzles. The first DLC for the game, Isle of the Dead, was just launched and brings the crew and their theatrical narrator to the jungles and beaches of a pirate settlement. In an unknown region of the Mediterranean, skeletal pirates come in hordes, but the brigade has backup. New character and former stunt-pilot Tessie Caldwell joins the group to battle the dead. She is a thrill-seeker and “just as deadly on land as she is in the air.” Caldwell is not the only unique personality added to Strange Brigade. A cowboy-themed Patrick “Bash” Conaghan was previously recruited and Rebellion Development’s roadmap plans on introducing at least two new characters by the end of the year. Gamers can play as the Japanese naval officer, Hachiro Shimizu, by the end of October and the Maharani huntress, Anjali Khan, in November. Both character releases will be accompanied by the second and third DLC campaigns. Along with the recent release of Isle of the Dead comes new and free maps. Two of the maps are for the Score Attack mode and one is for the Horde Mode. 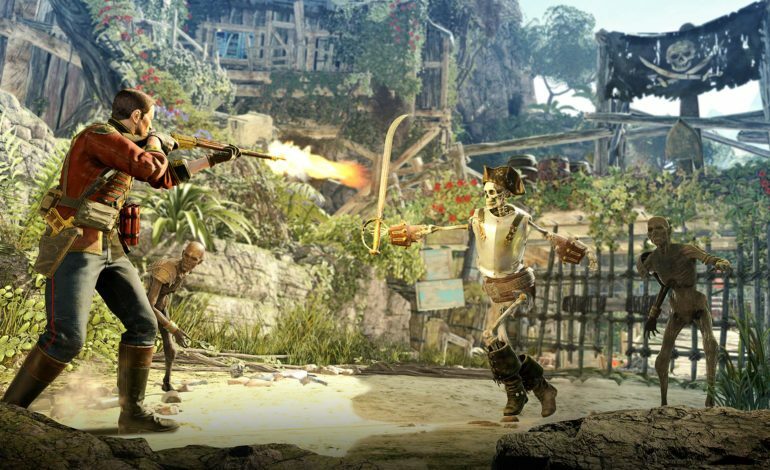 Strange Brigade‘s timeline is set to release more Score Attack missions and Horde Mode maps simultaneously with the next characters and DLC packs. Each of these maps are based upon levels from the campaign, but have been tweaked for their particular and chaotic game modes. Strange Brigade is available for Xbox One, PlayStation 4, and PC.